This morning’s breakfast was a bit of a disappointment. Kojo Brown is a sometimes-regular cafe for these monsters, and we’re usually pretty happy with the food served, which is why it’s a semi-regular haunt. But today’s breakfast was sub-par. Which is ironic since today was the day we went there to review it. The littler monster perused the menu (which had a few veggie options, to their credit, including a vegetarian breakfast chock full of items) and decided on the Mushrooms on Toast with poached eggs option, which is a number of types of mushrooms including shitake and enoki. Since I’m such a mushroom freak, I was looking forward to this. Coffee with soy, while waiting for the food, was a little disappointing, a bit bitter but still drinkable. When the breakfast arrived, it was a little surprising. The enoki was over-fried so much so that it looked like fried crispy onion. The other mushrooms were also a little over fried, making them tough and chewy. The poached eggs were not the best either, the whites were a little undercooked while the yolks were in parts bordering on solid. Not sure how they managed that, but it’s a trick I’ve never seen in any other cafe. The toast was thick and tasty but I don’t think it was buttered. I would have loved to been a fly on the wall at the meeting where all the cafes in Melbourne got together and decided they were all going to stop buttering toast. Plus, I wonder what the catering would have been like at that meeting. The bigger monster didn’t mind his breakfast, though he will say it looked a lot more flavoursom than it tasted… which is a problem for flavour really. Mushrooms, scramble on toast, hashbrowns and a tomato relish. Mushrooms looked like they were balsamic’d but it was clearly a cunning ploy as they were a bit cardboardy. The eggs needed a but of salt added to them cause other wise they just tasted like egg and i didn’t fancy my toast either. Turned very breaddy by the end. The relish was lacking in the sticky vinegary good of good relish, mostly seemed like tomato and onion sauce on the side, and watery sauce at that, and the hash browns were storebought and too hot. Hahaha, I’m so complainy. It wasn’t any where as bad as it sounds, it was pretty edible and I finished it, just… I dunno, I wanted something better. Somethign with a bit of flair. Sour cream in the eggs and garlic on the mushrooms or something, I dunno. BLAH. Coffee was okay and the waitress had to ask us how to spell relish, which I thought was a bit cute. She was struggling with English as a second language, not uneducated and she went bright red after asking… awww, foreigners, so adorable. All in all, not a great breakfast, but since they’re usually better than this, we’re gunna be a little generous with the points. Of course, if this is a downward trend rather than an accidental blip, we’ll let you know. Qeleven is what the monsters like to refer to as a weekday café. 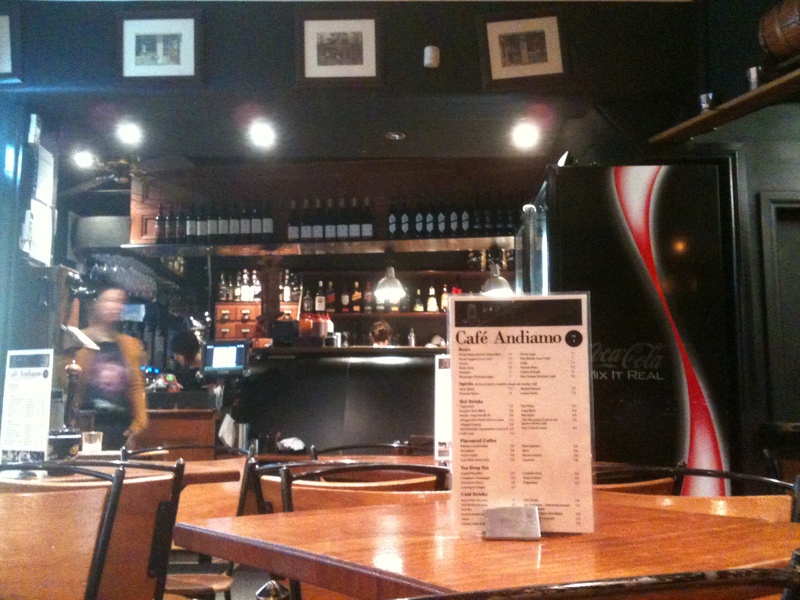 Situated directly across from the south Melbourne market and offering roughly ten tables in a space designed for four, it’s not a giant leap to understand why. On the weekends Qeleven is FULL of bastards. I mean, it’s edging through the crowded together backs of chairs only in there on the weekend, filled with ethically aware middle class market shoppers looking for a great deal on environmentally friendly beans , imported sounding cheeses and knock off perfumes, and of course, being south yarra, the heat waves of over privileged upbringings rise above them in offended facial contortions at the mere suggestion that they might pull in their chairs to let you through. However, if a weekend is all you’ve got oh workin pals of mine, then the food, despite the nasty that is the clientel, is totally, absolutely and bitchin awesomely worth it. Still, go on a weekday if you can. Parking. To begin with there’s a wide selection of interesting options for vegetarians that aren’t all up in your face about being vegetarian or a poor pile on of every vegetable in the kitchen that can be unpleasantly steamed. Normally I’ll go with the Mexican extravaganza but the other monster had that today so I’ll leave it up to her to describe. However, also of note are the corn fritters and chutney, the balsamic mushrooms with Meredith goats feta (I think, or it might have been marinated Persian today), the potato and quinoa roesti and the shredded potato omelette. All masterworks. Instead, for you oh reader, today I had the vegetarian big breakfast. Now, normally I avoid these because they’re usually either the cop out, “we replaced bacon with boiled spinach” big breakfasts or they don’t have eggs. At Qeleven, perfectly scrambled eggs (you can ask for any way you want – I go with scrambled cause even eggs are a bit to animally these days and I have to trick myself into eating them) on toast that was a bit dry actually now that I think about it, though that would have been my only complaint. Ever. Spinach was wet and a on the edge of nasty spinach but held it together mostly through the addition of the feta. Sticky sweet tomato chutney, avocado mash with a lemon wedge (addition of lemon to avocado being a highly personal matter) a couple of the balsamic mushrooms and roast tomato that actually were roasted, a rarity in this town. All in all my least favourite of the Qeleven faire and still wipes the floor with two thirds of Melbourne’s so called best breakfasts. The other monster was overwhelmed with choice staring at the menu. So, so many things to eat and all of them assuredly good. (In fact you can see their menu on their site here: http://www.qeleven.biz/breakfast-menu) Usually I go with the mushrooms, as mushrooms and I cannot get enough of each other, and Qeleven make mushrooms that make all other mushrooms ashamed of being born mushrooms. But today I went with the breakfast burrito. That’s right my friends, these guys do A BREAKFAST BURRITO!! Magic, I assure you, pure magic. On the menu it’s explained as ““Mexican Extravaganza” mushroom and cheese quesadilla, fried eggs, pumpkin and coriander roesti, tomato and corn salsa , chipotle mayo” It sounds good just reading it, but I assure you that putting this in your mouth is so much better than you can ever imagine. Everything in this dish is a perfect balance of flavours. Plus, their coffee is perfect and I’d live right next door if I could. Qeleven is the breakfast we compare the other good ones too to see if they shape up to being the 5 out of 5 we’re giving these guys. It’s very, very rare that they do. 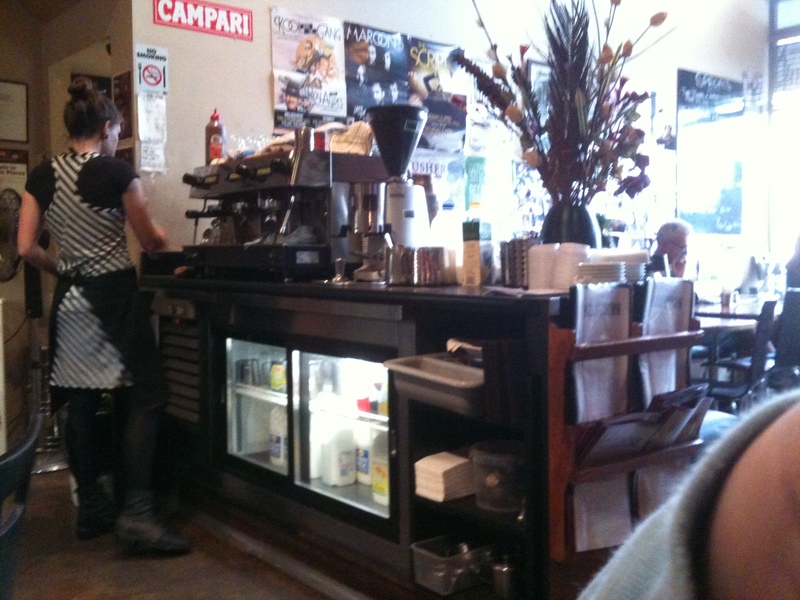 For a long time, Cafe Matto had painted on it’s window AS SEEN ON CHANNEL NINE’S THE CHOPPING BLOCK. Never having seen the show I’m not really sure what kind of competition it was between Matto and the cafe next door but I’m betting it’s not about the food. To be fair they had a vegetarian breakfast option on the menu, and it was listed second under the breakfast section. It offered eggs, toast, spinach, roasted tomato, mushrooms, avocado, hash brown and asparagus. It was the asparagus that sold me, you don’t often see that included in a vege breakfast. So that’s what I ordered. When the breakfast arrived there were 2 poached eggs which were a little under done, the whites near the yolks were still watery, the toast was singular but large, so that’s a point right there, but very dry. I think butter had been waved in it’s general direction but clearly not a lot got ON the bread from that. The spinach was cold and very wet by the time it reached me, I tried a little tentatively but it was as I suspected and thus I didn’t touch it again. The hashbrown was store bought macdonalds shaped, nothing spectacular but at least well cooked. The mushrooms were small but plentiful and tasted ok but were really nothing special and the ‘roasted’ tomato had a little black circle burnt on it’s bottom that confirmed the fact it was fried and not roasted at all. The tiny sprinkle of what I assume was rosemary on top did nothing to hide the fact that it was clearly not roasted. The asparagus was pretty good, although only 2 spears, which was a little dissapointing. The coffee, when it came, was a little bitter and the fact that it came when we were almost done with our meal despite the fact that we had ordered coffees the minute we sat down didn’t help the situation any. Yes, the service was pretty poor on this occasion (it’s been and is once again a local establishment of the monsters and so, when we’re feeling lazy, gets a fair bit of repeat business). They’re usually pretty good in that bustly kinda suburban cafe way, but today was either new staff or back from the holidays jitters cause it was a bit all over the shop. The other monster had the usual, mushrooms, hash and scramble, and it seemed like a perfect channel nine meal, looked kinda good on the surface but had absolately no taste. Lots of salt went on them eggs i tell you. Lots. It was all cooked well and, to be fair, the mushrooms were plentiful and pretty tasty (not sure what they tasted of and it sure wasn’t mushroom) but over all, bland, firm and dry are the active verbs that come to mind for todays experience. It’s worth noting that there was also a second vegetarian in the breakfast bruscetta. Tomato, basil and onion on an english muffin with holindaise sauce and what I’ll bet are confused looking poached eggs by their side. Neither of the monsters had it but both considered it. Maybe next time we’re feeling lazy. Finally, a new cafe that does an awesome breakfast. 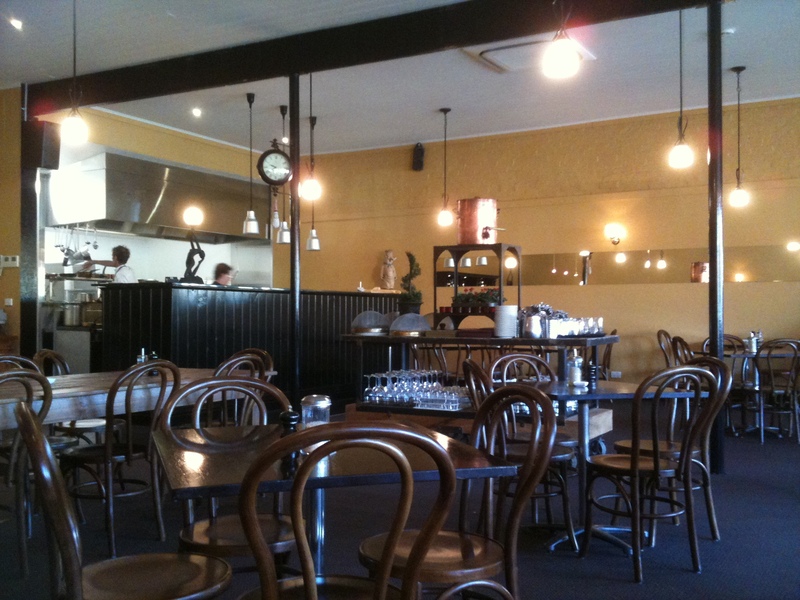 We’ve been a bit conscious of reviewing either all our favourite cafes as great and all the new ones as a bit pants. Pepper breaks the pattern. 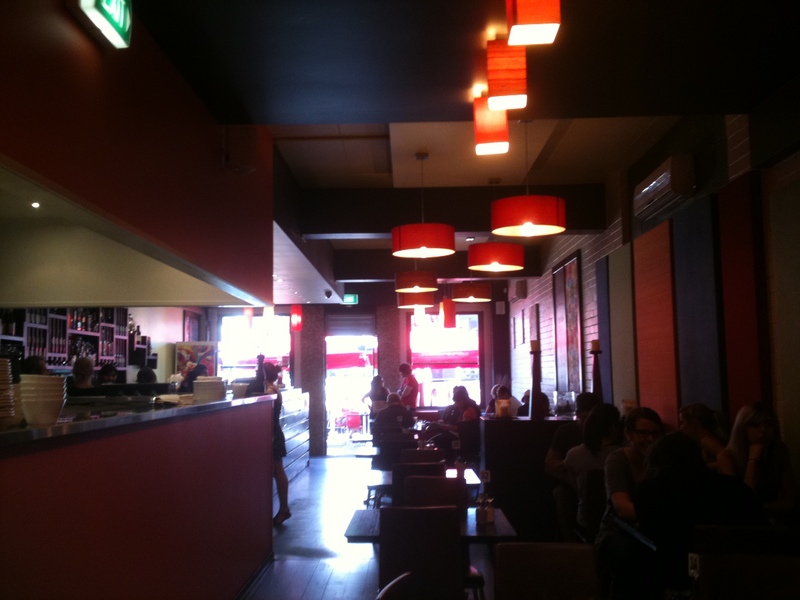 The front room was more trad cafe with tables surrounded by brunching mums, coffee machine, till and muffins (though the muffins looked home made and pretty great). But out the back there’s a little room , which looked like it might once have been a really small living room or bedroom in an old ascot vale pretty house, where the sun (or the rain difused grey light in the case of today) spilled in through a big window onto the world and only a handful of hipsters sat quietly each at their table, variously on their macbook pros, ancient dells and us on our iPhones. Oh how screamingly now. Then came the coffee. Then came the food. 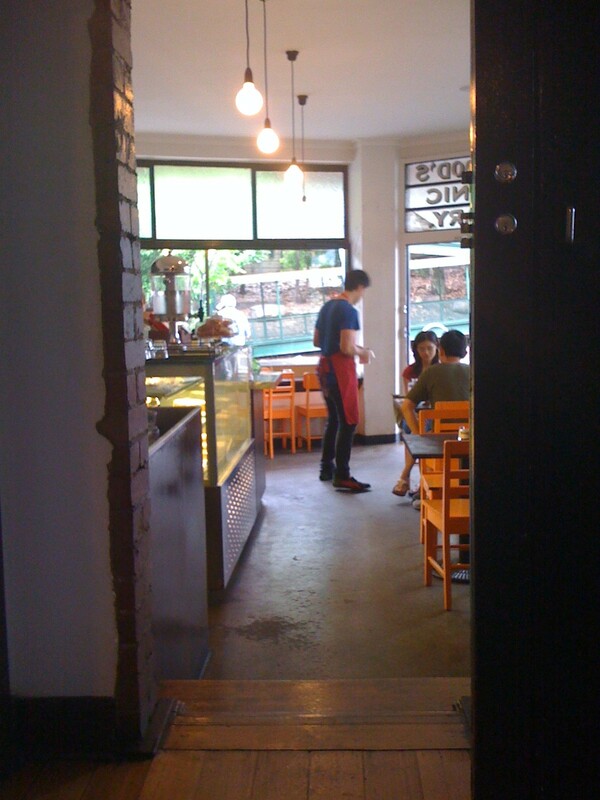 I mean, I was convinced the wait staff would forget we were there but it seemed like the kitchen was on the other side and they kept walking past us so we were rapidly served (by a dude who looked the image of the out of work neighbours actor, ironic considering Peppers’s Pin Oak address. not that Pin Oak tho, keep it in your pants telly tourists.). Pepper is like scoring something wonderful in an unexpected place. In fact it is exactly that. We give Pepper 4 out of 5. Navigating clutter of tables and umbrellas down Degraves means dodging the strollers, sixteen year olds and funky old folk sipping lates and fighting over whose fault it was Sharon’s perm turned out wrong or Shayla dumped Jordan just after Math Methods. BLERG! GO HOME AND ROT AND DIE YOU HALFWAY HIPSTER HOMUNCULI. Well, on to the food at Andiamo. Coffee wasn’t too bad, creamy and not served at a hundred degrees but I may be being overly generous having returned from an oddysey in a rural wasteland where coffee generally means nescafe. Breakfast included poached eggs which seemed small, buttered but somehow still desert dry toast, mushrooms that the other monster pointed out tasted suspiciously of doritos, a store bought hashbrown, a quote unquote roast tomato and a ramekin of baked beans that may have suited hungry little human beans but were far from gourmet. Again, if wanted this supermarket store bought crap I’d stay at home and have my friends to slingshot it at my face. PS, parking was ample, because we left the car in Clifton Hill. 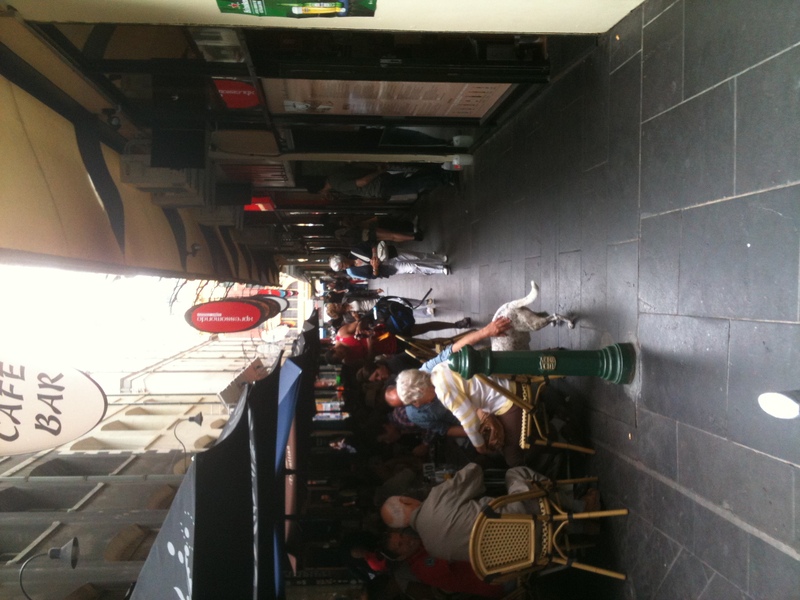 For more on Degraves street look for the picture of the laneway or consult your nearest @rsehole. The other monster took a quick look at the menu and decided on the vegetarian breakfast too. It had all the regulars – mushrooms and beans, and came with a hash brown too. The waitress was clearly not having a good day, I ordered our regular coffees for both of us (“A flat white and a soy flat white”) and then she looked at the other monster and asked him what coffee he wanted. Clearly I am a two coffee monster in the morning. She also dropped a few things and delivered cutlery which was less than clean, but I’m blaming that on the cafe rather than the girl herself. The cutlery part of that sentence anyway. The mushrooms were small but plentiful but did indeed taste like mushroom shaped doritos chips, which was off putting. The eggs were good, firm and runny yolks but the toast was so crunchy the whole way through it was more like two giant croutons than pieces of toast. But we did get two, so that’s a point in their favour. The beans were from a can, which has prompted me to start tagging some of these reviews with “good homemade beans” for when I have that craving and the hash brown was regulation store bought elongated oval type. 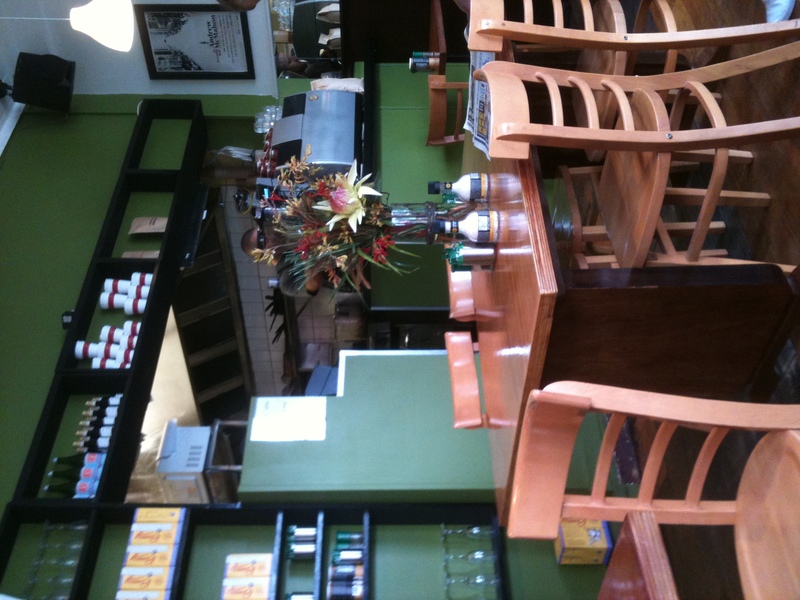 Spread out Formica tables and vinyl chairs clutter the floor of The Old Fires station cafe in Preston in what must ironically be some kind of fire hazard. Couches in the corners make for comfy sitting but hunched over eating and a cross section of clientele covering suburban mothers clubs to the grizzled and hard worn middle age used to be artist now mid level executives clatter in looking for coffee and the odd muffin. A bunch a crazy crap on the walls and funTM colours give the old fire station a bright and cheerful veneer that is resolutely unercut by the scowling wait staff growling your order back at you. Food wise the scramble (I’m boring and predictable, I know, I don’t care) was solid and eggy, which for me requires salt to mask the eggyness. I’m having a thing with eggs atm. It’s my problem, I’ll deal with it, i shouldn’t burden you with it. The mushrooms were many and not bad, well cooked and with a hint of something that tasted corianderish, so maybe ground seed, who knows, I make this stuff up as I go along anyway. Hash browns are store bought deep fried traingles that give an element of at least you know you’ve got something greasy and salty to finish with, and today one monsters plate came with unasked for baked beans (in what must be the chinziest serving ever, maybe a table spoons worth if that) and an inexplicable salad of various limp lettuces. WHY IS THERE SALAD ON MY PLATE AT NINE IN THE MORNING? Overall, not a bad breakfast but if you’re going to butter your toast, you should really commit to it. leaving like two inches of toast unbuttered is like some kind veiled insult I think. They do a vegetarian option breakfast which includes the standard beans, greens and avocado. Just because I’m vegetarian doesn’t mean i don’t like a good fry up. Address this now or i’ll start to picket. Somewhere. I don’t know where. Lets say The Wheeler Centre, they seem to get things done. This monster, feeling tired and groady from the day before, ordered her usual as well. Poached eggs, mushrooms and beans. She only meant to ask for eggs and mushrooms, since the beans were not offered as a side on the menu at all, only as a dish by themselves, but due to the aforementioned tiredness clearly just rattled off the usual order and thus got it. The poached eggs were a little overdone, the whites were still good but the yolks were hard. They were also pretty wet, meaning that the two layers of toast were soggy before I’d even touched the plate. However, the Fire Station gets points for two pieces of good sized bread, something that’s becoming more and more rare as the years go by and panic about obesity becomes more visible. Unlike my colleague, I felt the mushrooms were pretty plain. Not boring, they at least had a vague hint of mushroom taste, but nothing to write home about (although clearly something to blog about) and the beans were straight from can to microwave to customer. The coffee was good thou, and the soy was a good brand, not bitter or nasty tasting. 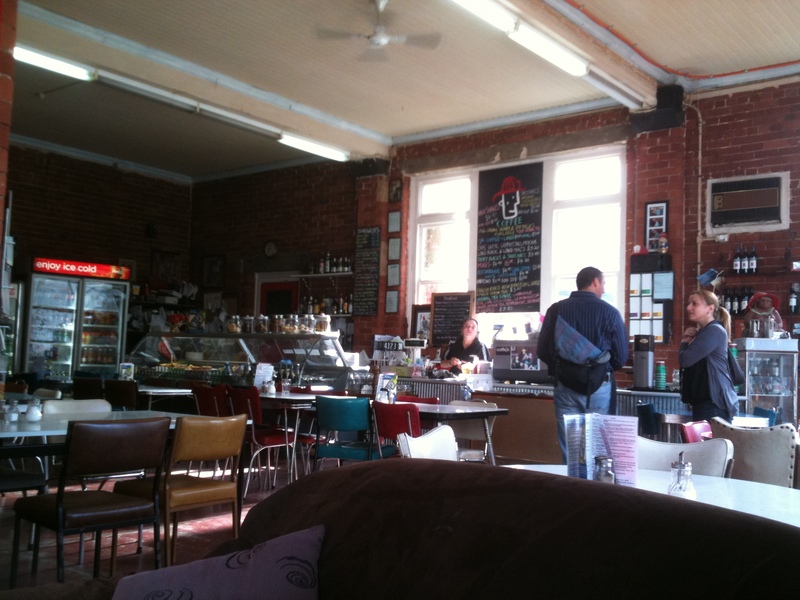 So another point there for the Old Fire Station Cafe. It was a blustery and windy morning when we ventured out to test out Flouch’s. During the course of our breakfast, clearly the 10 funkiest people in Kyneton were blown in like Flouch is some kind of funky vortex. There was even a black clad young couple who, if they had not driven from Melbourne specifically then they certainly keep up with all the Fitzroy trends. The menu wasn’t great as far as vegie options are concerned. We don’t count muesli, toast with jam or pancakes as part of a cafe’s vegie options, we’re looking for the cooked type of proper breakfast, just without the meat. Surprisingly difficult for cafes to do, clearly. Failed Posh Breakfast no. 679. The coffee was ok thou. So they gain one point for that. The Monsters Breakfast is a record of our ongoing attempt to find a decent vegetarian cafe breakfast in a world of bacon and chipolata hegemony.